Newton Aycliffe Sports Club were defeated in their League Cup game away to Gainford Cross Keys at the weekend. Having played out a 4-4 draw earlier in the season both teams knew it was going to be a tough opening tie to the competition. 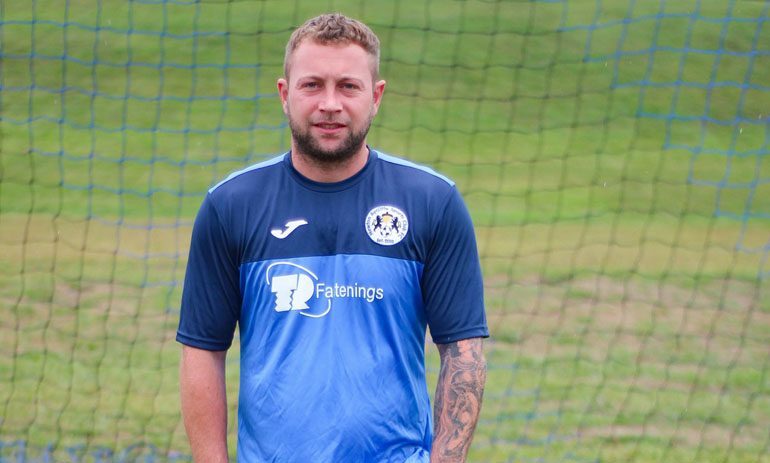 The Sports Club opened the scoring on the half hour mark with some good work on the right wing by Kyle Allen finding Darren Bosomworth (pictured above) who latched onto the pass and rifled home the shot. Gainford pressed and within 10 minutes were level when a cross into the boxed was only punched away by stand in keeper Adam Gittins and the ball fell to the host to equalise just before the break. Gainford started the second half stronger and went 2-1 in front when the ball was lost by the Aycliffe sides midfield and slotted home by the hosts. The Sports Club stepped up a gear and got the equaliser on the hour-mark, Bosomworth getting his brace to make it 2-2. With both sides determined the tie would not go straight to penelties it was Gainford who re-established the lead when a corner failed to be cleared, and with a suspicion of handball the home side managed to grab the lead. As Aycliffe pushed for an equaliser, the inevitable happened when they were caught on the break and with almost the last kick of the game the hosts made it 4-2 to go through to the next round of the cup. This weekend sees the Sports Club travel to Bishop for a Division Two League Cup tie against Bishop Auckland Snooker Club.